Discussion in 'Star Style' started by alicia753, May 17, 2009. 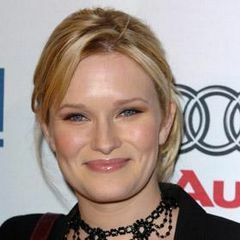 Nicholle Tom (born March 23, 1978 in Hinsdale, Illinois) is an American actress, most famous for her role as Maggie Sheffield on The Nanny. Nicholle Tom currently stars in the IFC original The Minor Accomplishments of Jackie Woodman as Tara, an underling at a film production company. Her twin brother, actor David Tom, and older sister (by two years), Heather Tom, have both won Emmys for their performances on CBS's "The Young and the Restless" (1973). Nicholle's height is 5' 7" (1.71 m). She is the daughter of Marie and Charles Tom, who are now divorced. Before her fame on The Nanny, she was known for playing the role of Scott Scanlon's sister Sue on Beverly Hills 90210 during its earlier years on the air. Also, in the early 1990s, she played 'Ryce' in the successful family movie Beethoven and the sequel Beethoven's 2nd. She did not appear in Beethoven's 3rd and Beethoven's 4th as she had grown up too much for her specific role. She recently provided the voice for Supergirl in the DC Animated Universe. In 2000, she played Sarah Bryan in the Fox Family TV film Ice Angel as well as Tracy in Panic. In 2001, she portrayed a teen reporter named Cassie in The Princess Diaries. Feb 2006 - Santa Barbara, CA - Nicholle Tom. 21st Annual Santa Barbara International Film Festival - 'Modern Master Award' - Arrivals held at the Arlington Theatre. She's pretty cute, and very normal in person. I worked at a stationery shop in Los Angeles and a few months ago she popped in to purchase stationery for a bridal shower she was helping to plan.